Honey, I shrunk the Glock! LOL the funny! the owner is now selling it after the "Upgrade"
Ruger s new 1911 Leaked! 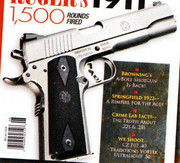 Ruger's new 1911 spotted in a preview add Looks alright. Should be retailing for around 850 USD. Picture Courtesy of AAC! These guys rock at what they do. So now the carcal has a hammer. Also, apparently the frame is made out of scandium or some other space age thing. All times are GMT +5. The time now is 06:04 AM.